The Reeds-Shepp path segment types. Define the type of state allocated by this state space. Define the type of state allocated by this space. Computes the state that lies at time t in [0, 1] on the segment that connects from state to to state. The memory location of state is not required to be different from the memory of either from or to. Convenience function that allows derived state spaces to choose which checks should pass (see SanityChecks flags) and how strict the checks are. This just calls sanityChecks() with some default arguments. Return the shortest Reeds-Shepp path from SE(2) state state1 to SE(2) state state2. Set the bounds of this state space. This defines the range of the space in which sampling is performed. Get the bounds for this state space. Allocate a state that can store a point in the described space. Free the memory of the allocated state. Register the projections for this state space. Usually, this is at least the default projection. These are implicit projections, set by the implementation of the state space. This is called by setup(). Construct an empty compound state space. Check if the state space is compound. Print the settings for this state space to a stream. Compute the location information for various components of the state space. Either this function or setup() must be called before any calls to getValueAddressAtName(), getValueAddressAtLocation() (and other functions where those are used). Perform final setup steps. This function is automatically called by the SpaceInformation. If any default projections are to be registered, this call will set them and call their setup() functions. It is safe to call this function multiple times. At a subsequent call, projections that have been previously user configured are not re-instantiated, but their setup() method is still called. Adds a new state space as part of the compound state space. For computing distances within the compound state space, the weight of the component also needs to be specified. Get the number of state spaces that make up the compound state space. Get a specific subspace from the compound state space. Get the index of a specific subspace from the compound state space. Check if a specific subspace is contained in this state space. Get the list of components. Get the list of component weights. Return true if the state space is locked. A value of true means that no further spaces can be added as components. Lock this state space. This means no further spaces can be added as components. This function can be for instance called from the constructor of a state space that inherits from CompoundStateSpace to prevent the user to add further components. Allocate a sampler that actually samples only components that are part of subspace. Bring the state within the bounds of the state space. For unbounded spaces this function can be a no-op. Check if a state is inside the bounding box. For unbounded spaces this function can always return true. Get the number of chars in the serialization of a state in this space. Write the binary representation of state to serialization. Read the binary representation of a state from serialization and write it to state. When performing discrete validation of motions, the length of the longest segment that does not require state validation needs to be specified. This function sets this length as a fraction of the space's maximum extent. The call is passed to all contained subspaces. Count how many segments of the "longest valid length" fit on the motion from state1 to state2. This is the max() of the counts returned by contained subspaces. Checks whether two states are equal. Allocate an instance of the default uniform state sampler for this space. Constructor. Assigns a unique name to the space. Return true if the distance function associated with the space is a metric. Check if the distance function on this state space is symmetric, i.e. distance(s1,s2) = distance(s2,s1). Default implementation returns true. Check if the interpolation function on this state space is symmetric, i.e. interpolate(from, to, t, state) = interpolate(to, from, 1-t, state). Default implementation returns true. Get the name of the state space. Set the name of the state space. Return true if other is a space included (perhaps equal, perhaps a subspace) in this one. Return true if other is a space that is either included (perhaps equal, perhaps a subspace) in this one, or all of its subspaces are included in this one. Get the parameters for this space. 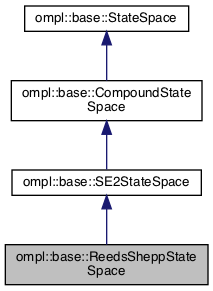 When performing discrete validation of motions, the length of the longest segment that does not require state validation needs to be specified. This function returns this length, for this state space, as a fraction of the space's maximum extent. Set factor to be the value to multiply the return value of validSegmentCount(). By default, this value is 1. The higher the value, the smaller the size of the segments considered valid. The effect of this function is immediate (setup() does not need to be called). Get the value used to multiply the return value of validSegmentCount(). Get the longest valid segment at the time setup() was called. Compute an array of ints that uniquely identifies the structure of the state space. The first element of the signature is the number of integers that follow. Allocate an instance of the state sampler for this space. This sampler will be allocated with the sampler allocator that was previously specified by setStateSamplerAllocator() or, if no sampler allocator was specified, allocDefaultStateSampler() is called. Set the sampler allocator to use. Const variant of the same function as above;. Get the locations of values of type double contained in a state from this space. The order of the values is consistent with getValueAddressAtIndex(). The setup() function must have been previously called. Get the named locations of values of type double contained in a state from this space. The setup() function must have been previously called. Get a pointer to the double value in state that loc points to. Get a pointer to the double value in state that name points to. Register a projection for this state space under a specified name. Register the default projection for this state space. Get the projection registered under a specific name. Check if a projection with a specified name is available. Check if a default projection is available. Get all the registered projections. Get the substate of state that is pointed to by loc. Get the set of subspaces that this space and other have in common. The computed list of subspaces does not contain spaces that cover each other, even though they may be common, as that is redundant information. Print a Graphviz digraph that represents the containment diagram for the state space. Print the list of all contained state space instances. Allocate the state components. Called by allocState(). Usually called by derived state spaces. The state spaces that make up the compound state space. The weight assigned to each component of the state space when computing the compound distance. The sum of all the weights in weights_. Flag indicating whether adding further components is allowed or not. A type assigned for this state space. An optional state sampler allocator. The extent of this space at the time setup() was called. The fraction of the longest valid segment. The longest valid segment at the time setup() was called. The factor to multiply the value returned by validSegmentCount(). Rarely used but useful for things like doubling the resolution. The set of parameters for this space. All the known value locations, by name. The names of state spaces access the first element of a state. RealVectorStateSpace dimensions are used to access individual dimensions. All the known substat locations, by name. Print a Graphviz digraph that represents the containment diagram for all the instantiated state spaces. Print the list of available state space instances. static const std::string DEFAULT_PROJECTION_NAME = ""
The name used for the default projection. An SE(2) state space where distance is measured by the length of Reeds-Shepp curves. The notation and solutions are taken from: J.A. Reeds and L.A. Shepp, “Optimal paths for a car that goes both forwards and backwards,” Pacific Journal of Mathematics, 145(2):367–393, 1990. This implementation explicitly computes all 48 Reeds-Shepp curves and returns the shortest valid solution. This can be improved by using the configuration space partition described in: P. Souères and J.-P. Laumond, “Shortest paths synthesis for a car-like robot,” IEEE Trans. on Automatic Control, 41(5):672–688, May 1996. Definition at line 63 of file ReedsSheppStateSpace.h. Definition at line 75 of file ReedsSheppStateSpace.h.